The Amateur Astronomers Association of Pittsburgh invites you to the Saturday, November 11, 2017 Mingo Creek Park Observatory Star Party, inside Mingo Creek County Park, Mansion Hill Extension, past Shelter 10,Washington County, PA. Phone #: 724-348-6150. In case of inclement weather, check the website www.3ap.org or Facebook Page for a cancellation notice . Come and learn about the Mingo Creek Park Observatory, the Amateur Astronomers Association of Pittsburgh and astronomy in general. There will be safe observing of the Sun on the 4” Lunt telescope. After dusk come and observe the wonders of the night sky. Planets observed may include views of Saturn with its rings. Many deep sky objects may also be observed such as the Ring Nebula and other nebulae, clusters and double stars. Presentations about current events in astronomy and the Mingo Creek Park night sky will take place in the Richard Y. Haddad Planetarium at various times throughout the evening. The Mingo Creek Park Observatory is handicap accessible. Mingo Creek Park Observatory is operated by an all-volunteer staff of members of the Amateur Astronomers Association of Pittsburgh. There is no charge for your visit, but we gladly accept donations to cover operating expenses. There is no reservation needed and there is no limit on group sizes. Special Rates Lodging Rates are available for the Mingo Star Parties here through Washington County Tourism Promotion Agency. November 11 Mingo Star Party concludes the Mingo 2017 Star Party Season and is the final observatory star party of the AAAP 2017 Star Party Schedule. 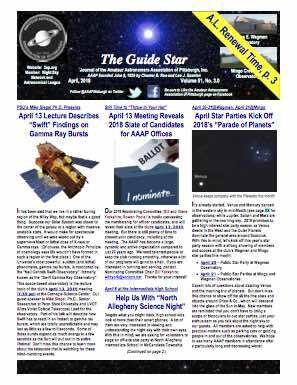 The Amateur Astronomers Association of Pittsburgh thanks you for support our 2017 observatory events. Next year’s dates are listed at the end of this post and on the website .